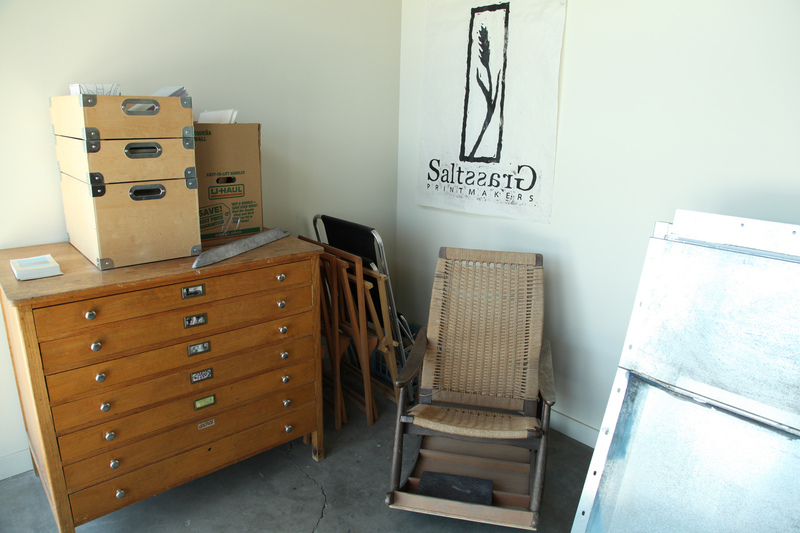 A few boxes remain to be unpacked in the entryway to Saltgrass’s new home. 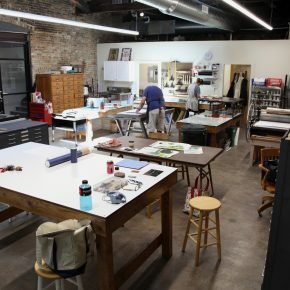 In anticipation of a grand reopening party on Saturday, Sept. 16., members, friends and volunteers are putting the finishing touches to Saltgrass Printmakers’ new space this week. Gentrification pushed the nonprofit out of its original Sugar House haunt, a nondescript 1920s bungalow behind Subway and the Avon store. 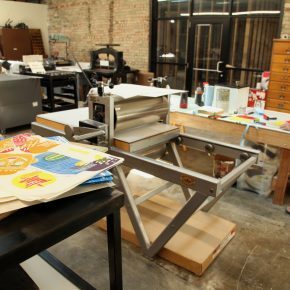 That space, repurposed as it was from a family dwelling, was never ideal, but for over a decade it served as a hub for Utah printmakers, offering exhibitions, workshops and studio space. To make room for a multistory housing complex that is currently under construction, Saltgrass was squeezed out in 2016. 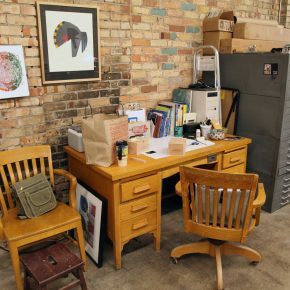 The organization — started by Stefanie Dykes and Sandy Brunvand when the pair was fresh out of graduate school — had to scramble when they received that eviction notice, but they’re very happy with the new home they’ve created in Salt Lake City along the I-15 corridor. “It had the look we wanted,” Dykes says of their new digs, located in a jumble of buildings along 700 West, overlooked by the 400 South freeway ramp. With tall ceilings and exposed brick and ducting, it’s open and airy but exudes the work ethic of a former industrial space. “It’s a dream come true,” Dykes says. 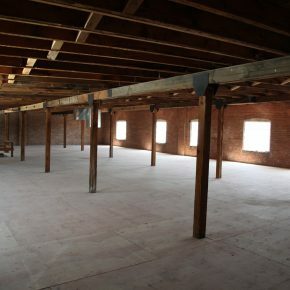 Saltgrass member Jared Nielsen concurs, comparing the old space, where storage, workspace and presses were all in different rooms and on different floors, to the new one, where everything is easily at hand. 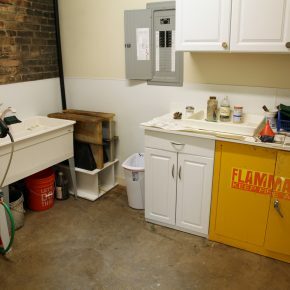 The single room can mean that when there’s a workshop going on, there’s no place to hide, “but you just put your headphones on,” Nielsen says. Stefanie Dykes, executive director of Saltgrass Printmakers, in their new space. 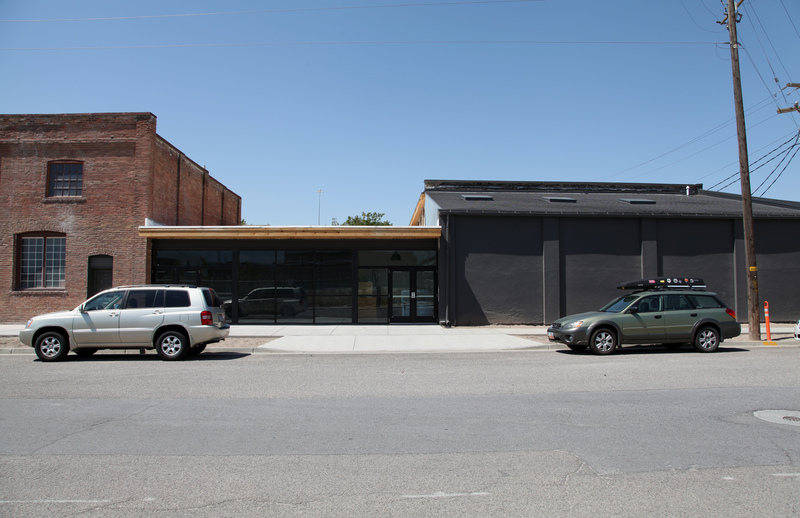 Saltgrass is the first tenant in what will become Salt Lake City Artist Studios, a project being developed by Jason Boe. 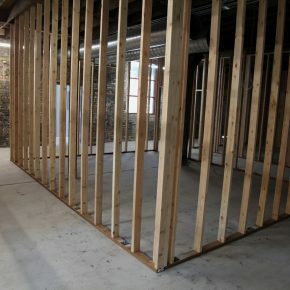 Some 2x4s are going up throughout the former iron foundry, and a few studios are already completed. 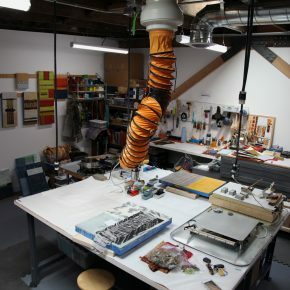 Nancy Vorm, along with studio mate Sue Martin, occupy one, a second-story space that features a skylight and exhaust system (Vorm works in encaustic). “[Jason] has put in what we’ve wanted,” she says. 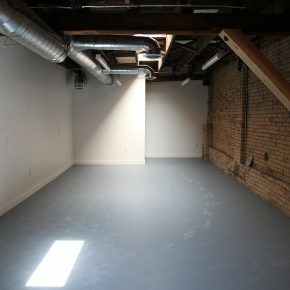 The Salt Lake City Artist Studios will feature multiple entrances, a newly finished spacious bathroom and studios that come in a variety of sizes. They go for about $1.30/square foot. Dykes has made an informal agreement to act as promoter and liaison for the emerging studio complex. 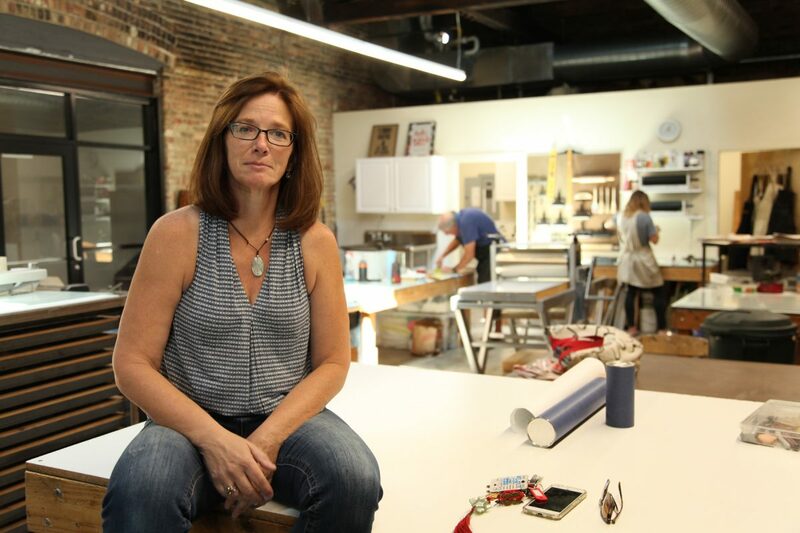 While they were waiting for their new home to be built out, Saltgrass went on hiatus for more than six months, an uneasy situation for a nonprofit dependent on dues and workshop fees to operate. But the programming they have built up since 2004 has instilled loyalty. 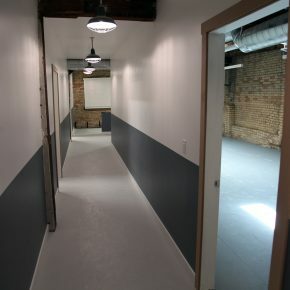 “We opened our doors in June and all our members came in,” Dykes says. Saltgrass has 10 dues-paying members, who have full-time access to the facility. 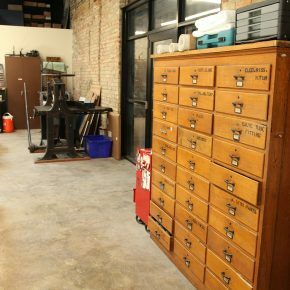 In addition, nonmembers can pay to use the space by the hour, and now that the organization officially will be back in business, expect a full roster of workshops, for all levels of printmakers, to be rolled out soon. What you may not find at the new Saltgrass is as many exhibits. The space doesn’t have the walls for it, and they are no longer sited along any natural gallery route. “We’re adjusting to a new neighborhood,” Dykes says. She indicates they’ll be looking to reach out to the neighborhoods and schools nearby, on Salt Lake City’s west side, to bring their programming into the community and make new friends. In the meantime, they’re throwing a party for all their old friends, especially those who helped make the move possible. The view from 700 West. The dark gray building houses Saltgrass. Expect to see signage out front for the party on September 16th. Saltgrass Printmakers’ Grand Re-Opening, Saturday, September 16, 6:30-9:30 p.m. (412 S. 700 West) features music by Color Animal, food by Blended Table, the print exhibit “Heavy Lifting” and a silent auction fundraiser.